Yesterday, on the eve of the launch of the cost of childcare campaign, I was interviewed by a couple of Scottish newspapers. I'm volunteering on the parent panel of the Daycare Trust which is why occasionally I get called with extremely short notice to speak to a journalist or two. Initially I was a bit worried because I'm not up to speed what exactly the Daycare Trust is asking for. But I don't think this matters so much, it's just about having honest views of parents on the issues they campaign about, which bring the campaign to life. Even yesterday, I was very clear that I'm not the average case study because we don't spend the same amount other families spend on childcare. We're the lucky ones who have their kids in council nurseries for most of the hours that childcare is needed, which is about half the cost of private childcare. It is interesting to see what of the interviews makes it into the papers. There was one sentence which I totally hadn't said, it read along the lines of having had to consider to give up my job because of the cost of childcare. Now, it is true that I considered if it was financially viable to work, but I never actually would have chosen the path of handing in my notice, my considerations were simply in the light of looming redundancy. There is more to a job than the financial gain, plus, why should it be me who gives up the job if it's not financially viable? Surely the childcare costs are split between two incomes in our case and it's not simply about whether mum works or not. Other than that, the quotes were bang on but obviously left out quite a lot of detail and width that I had spoken about. Both papers asked me for my solutions to the cost of childcare. I explained how in other countries, childcare is subsidised so that the maximum cost to the parents is capped. This makes childcare affordable for all. Of course, it costs money but the theory is that because more parents will be in employment, the cost is offset by the tax the government gets from these working parents. Another point I made was that the reduction of the childcare element of working parent tax credit to a maximum of 70% of childcare costs will be hitting the poorest parents most. 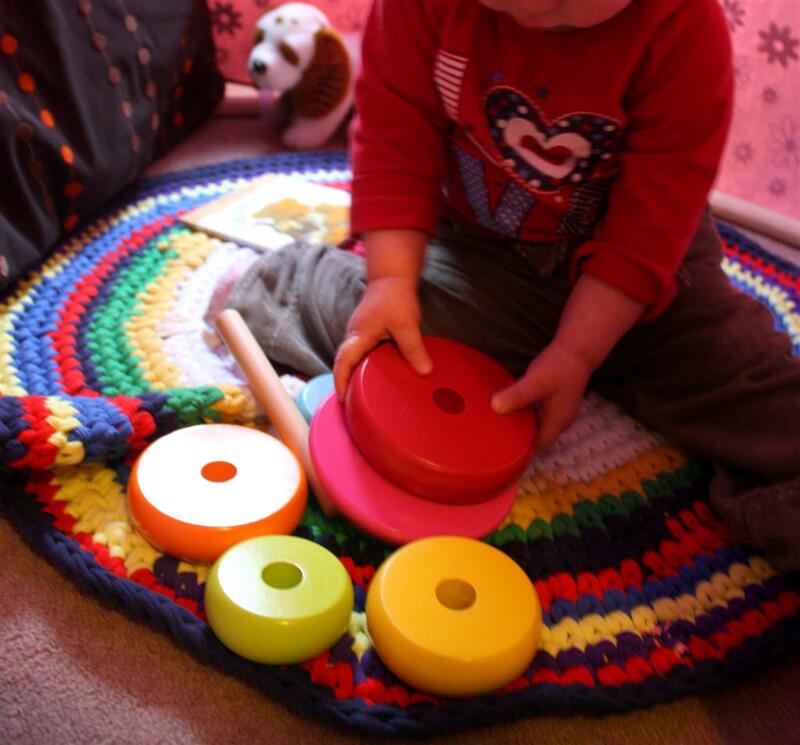 Effectively it means that if you are on a low income, you will have to pay at least 30% of your childcare costs. If you are on minimum wage, have rent/mortgage to pay, council tax, heating, clothing, food, phone and electricity bills to cover, that is a lot. To put it bluntly, while I'm pretty happy with the help of the meagre tax credits we get (not for much longer, I think we'll lose them once I increase my working hours), I'd rather we didn't get them and the government had kept the 80% level. One idea that didn't occur to me at the time was that it would really help if the childcare voucher amount was increased. Childcare vouchers are a system of salary sacrifice at source - if you are employed and your employer is signed up to it, you can sacrifice up to £243 a month of your salary which can then be paid for childcare. The saving is that you don't pay tax or national insurance on this amount. It is available to both parents, so if both work, it can cover almost £500. The maximum amount has been static for a rather long time, so it would be a solution to increase this. 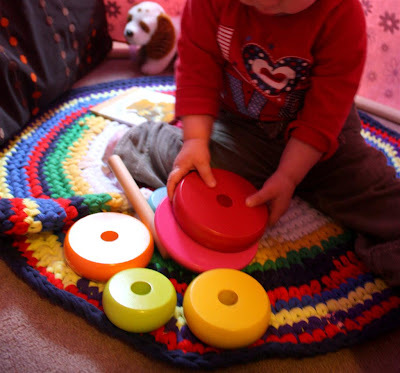 This would also help those parents where only one parent is in employment (as was the case for us - while we've always paid at least £500 in childcare since Cubling was 5 months old, we've so far only been able to make use of one parent's allowance). It seems unfair that if 2 parents are in employment you can save twice the amount while in situations where either one parent is not in employment or where there is only one parent, you can only save the tax on £243. It is usually the case that families where there is only one employed parent could do with extra help, so why not have a maximum amount of, say, £500, which can be split between parents as they wish. Plus increase the maximum amount anyway as childcare regularly costs £600-£800 per child on a full time basis. I personally also wouldn't have an issue if the full cost of childcare could be offset against tax. This would help, but of course it would still mean that childcare remains a massive burden for parents. Of course there will be those who say that if you have kids, that's what you've bargained for. However, it has been shown that capping childcare costs and having universal childcare available to everyone leads to better maternal employment, better outcomes for children, and greater equality in society. This in turn means less expenditure for the failings of an unequal society (the cost of crime, vandalism, poor health and substance abuse). Sometimes spending more won't cost more, but less. 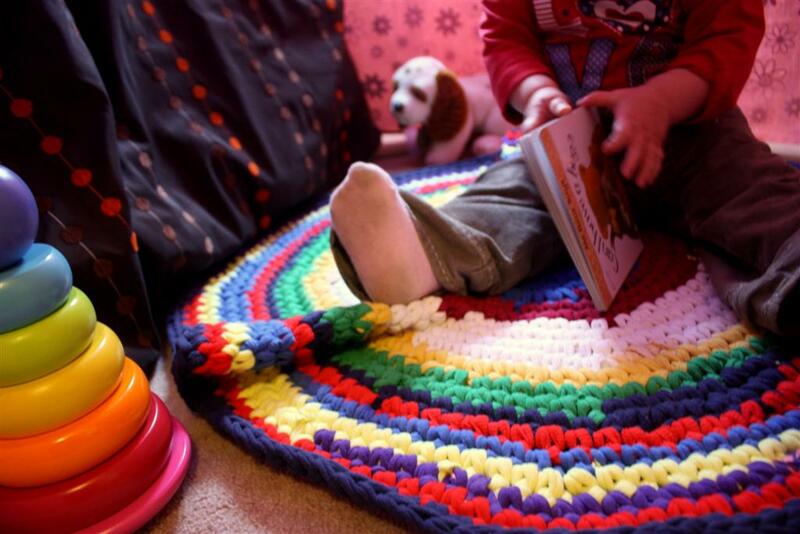 Do you have any ideas how parents could be better supported with the cost of childcare? If there is one thing that's doing my head in at least once a day, mostly significantly more than that, it's trying to get pre-schooler leave xyz (insert house, nursery, shop, car etc). It's getting ridiculous and it doesn't help that toddler is ever so keen on leaving and whinging to get us out of the door. To her, what lies ahead is fun, to the older child, she does not want to stop having fun where she is right now. We've gone from refusal, hiding and running away to open aggression. It's a constant grind, because nothing stresses me out more than trying to get us out of the house in the morning and make that nursery drop off trip that has no minute to spare for me to get a full working day wedged into the childcare hours available. So I've been looking for ideas and possible solutions. My facebook friends were kind enough to suggest things that work for them, or if not that, share their own failure to tackle this old enemy that often goes under the name of transition. Because it is about transition - 4 year old is as reluctant to leave for nursery as she is to leave nursery for home. It's the change that's the issue, not the destination. Starting earlier was a common thread. I won't dismiss it, but I know that even if I start earlier, when it comes to getting through the door, it's the same difficult situation. We still struggle to get dressed, to put shoes and jacket on. Being organised and ready to go - well, that does help but there's a limit to it as I don't like to prepare the packed lunch the night before and my kids waken as soon as I stir so I can't get dressed before they get up. I am reasonably organised and we don't stall much, so this is not really the issue in our case. What I can see if I step back is that our little problem has become filled with a struggle for control and power. The aggression is probably due to a vicious circle where my own annoyance creates tension, and that tension exasperates the problem, leading to aggression as the only way for Cubling to object. I know the theory of remaining positive, and yes I do follow the advice of getting attention first, being on same level as child, having clear instructions and being firm. It's not working. And when she runs off to evade the "shoes on, jacket on, let's go", she is now faster than I am with toddler on my arm. I have been seen to wrestle her down to put shoes and jacket on because I was just sick and tired of the same old game at every transition moment of the day. Enters the suggestion of singing a song. I instantly liked this though haven't tried it out yet for want of knowing a suitable song. Apparently, there even is something called a "transition" song. I like the blog post on how this works. The nice thing is that it does create a positive, feel good situation which is likely to break that vicious circle of negativity that we have ground ourselves. I'm keen to give it a go, though it may be tricky as she also generally objects to me singing (I don't blame her), but it's definitely worth a go. 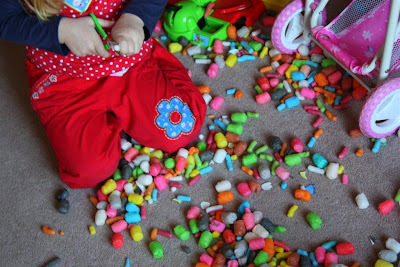 What are your tricks of the trade to get out of the house/nursery/play park without tears and negativity? 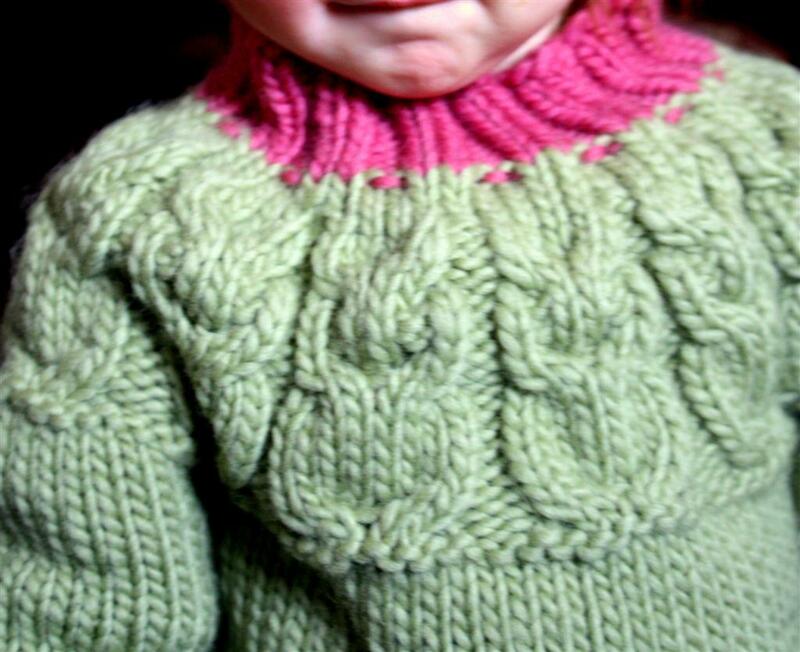 I've finished another owlets jumper! I know I know, it's been only a week since the last one but hear me out there's a story to this one. It was actually the first owlets that I started. It was knitted for Cubling, in size 4-5 years. Knitted on a long car journey to Skye and back, plus a couple of weekends after, it was a very quick knit on 6.5mm needles and with Rowan Little Big Wool. I was about 6 or 7 months' pregnant at the time. Now look at that baby - it's 17 months and I've finally finished it. Why? Well, I kind of finished it when pregnant but it was more than obvious that a) it was far too small for Cubling who wasn't even 4 yet, which was just as well because she told me in no uncertain terms she did not want to wear it anyway and b) something just didn't look right. So I looked at it, and looked at it some more in that stashed basket. One day, the penny dropped. I must have slipped sizes at the very start, the body part was simply too short. 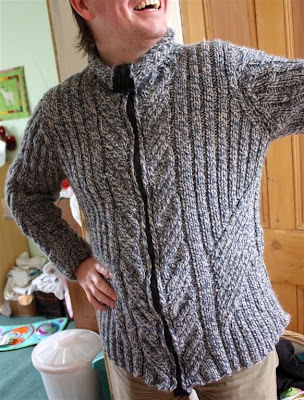 Which is kind of rubbish when the jumper is knit from bottom up. No way Jose was I going to unravel it all again. Thankfully, Ravelry folk came to the rescue and explained how I could save the owlets. pick up stitches and go for the cut, then knit some more and rejoin with kitcheners stitch. I admit I didn't like the idea of cutting my knitting, but it did work. With just about 20cms of yarn left, this is as long as I could do it with the yarn I'd left over, and it means it's a bit shorter than I'd hoped. But still, body and sleeves are much more in proportion. How convenient I have a younger child who promptly modelled it, and though a tad big, it's actually already a pretty decent fit. 5 years? Hm. Never mind. Snowflake is very proud of her new jumper. That's my girl. 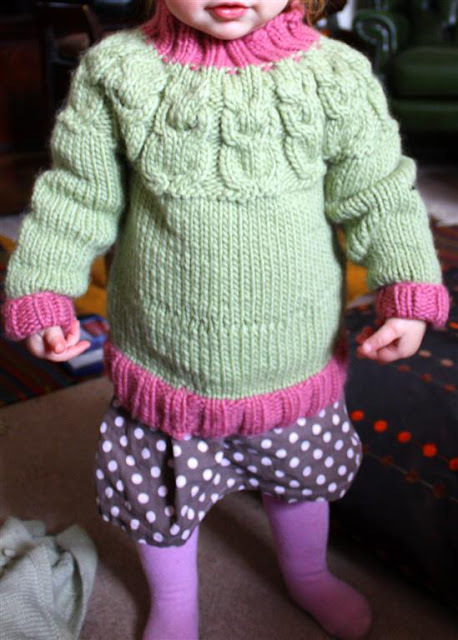 And this is probably the longest I've ever taken over knitting a kid's jumper. I know blogs are meant to be kind of up to date and like an online diary, but heyho, this is my space and who cares anyway. So remember mid term break? There is this interesting oddity that if your child attends a city council nursery in Glasgow, even on a full time basis, that nursery will be shut for in service days. Which is a pain in the back, because it means giving up precious annual leave. However, considering I feared that the whole of midterm break meant a nursery holiday, one day seemed not quite so bad. And then, magically, on that very day, it was the first day of spring. Sunshine, warmth and for all the plans I had, they had to be ditched because we simply had to get out and have a go at that pedal bike of Cubling's. Which meant that unfortunately, Cubling did not learn how to cycle from the keenest cyclist in the family, Grampa. Unfortunately she also didn't learn to cycle from her dad who really had hoped to have that honour. It also meant that I couldn't really claim any responsibility in the learning to cycle shenanigans either. Nonono, Cubling simply got on her bike and did it all by herself. Which actually means that although I do feel for Grampa and Daddy, I'm all the more proud of her. Now that was one in service day well spent! You know you're taking owls to Athens (that's the German version of "coals to Newcastle") when you knit a baby jumper and the recipient recognises the pattern. Well not the recipient strictly speaking, because he is only a few months old and may be more busy with things like learning how to wind everyone around his little fingers for sheer cuteness than knowing knitting patterns inside out. Ah well, I love this pattern and the yarns used are so must touch all the time soft that I'm sure baby J will be snug and comfy. This owlet jumper has been sitting for a while because I thought I had enough yarn of the first instalment for a second. But no, I didn't do my sums right and there it was sitting run out of yarn and it took me ages to find a yarn that could be used to finish it off. Bright red just doesn't go with many colours. Eventually I found katia merino sport (that's the grey bit 401 colourway, made in Spain - the red is Lana Grossa Nico) which I think is pretty much an ideal complement colour. I knitted size 6-12 months - the yarn is quite stretchy though so that I'm sure it could fit up to 18 months (which is good as I'm currently trying to save another owlet which turned out waaaaay too small). There's meant to be 13 owls but it turned out with just 12 - having a 6 months break before finishing off meant I wasn't quite clear what size and stitch number I was on, and while I'm not sure where I went wrong, it turned out looking just right. Hm. While I love this pattern, somehow I'm not very successful managing to make one for my own kids. Cublings turned out too small and simply wrong, this was meant to be Snowflake's and I ran out of yarn (and by the time I had found the right yarn, it was too small). Just as well there's still lovely new babies being born who need to be clad in handknits. Usually, the term in between jobs refers to some sort of unemployment. Which is not quite the case for me. 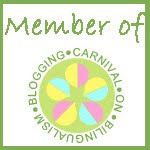 My current job is all go as it's heading towards its final bang (and I shall be seeking the help of interested mummy and daddy bloggers to promote an exciting initiative that one of the groups of young people have come up with). All the while, I'm being trained for my new job - still within Save the Children - which I'm also rather excited about and will be starting in April. As part of that training, I had taken on the task of preparing 40 special play bags. 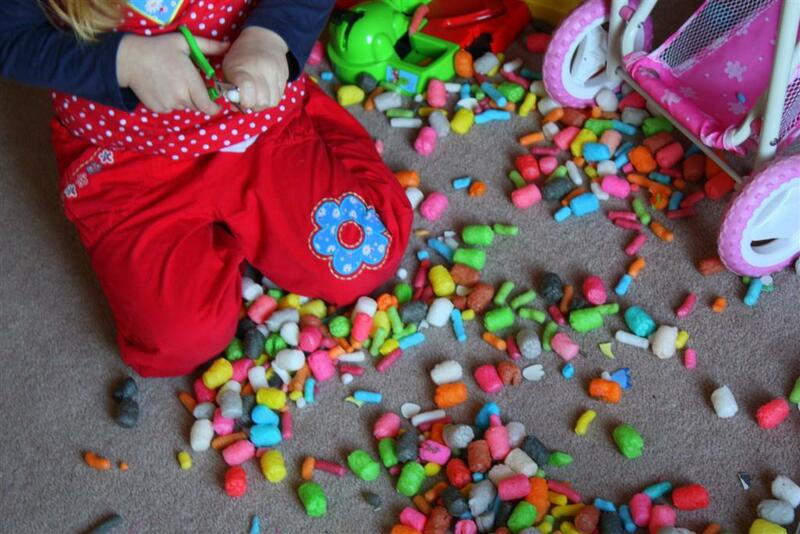 Turning our living room into a giant special play bag. I had some playful little helpers. 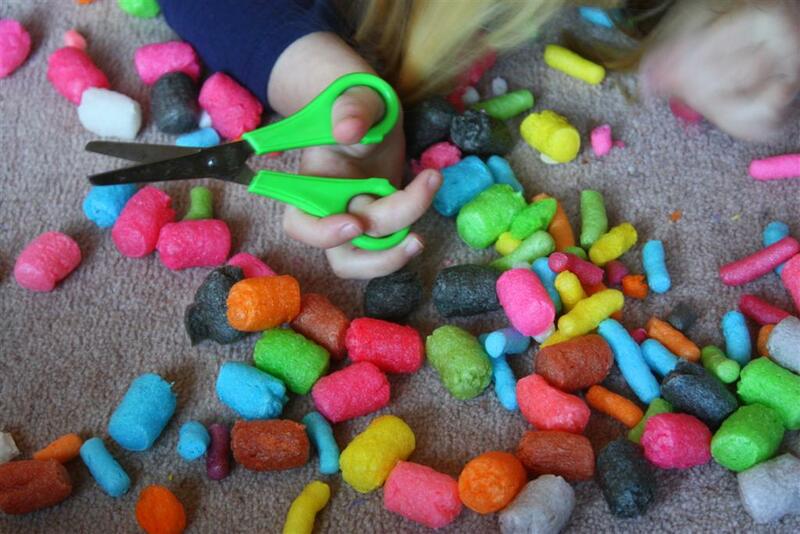 The fascination of the scissors has not waned. What can be cut shall be cut. Have I ever mentioned how thankful I am to the inventor of the vacuum cleaner? Expat life in the UK is a funny old thing at times. Most of the time I honestly don't think about it. I feel at home here, having lived a considerable part of my adult life in this city. Sometimes I realise how many people in Glasgow aren't actually from Glasgow, but mostly, everyone is "just" a person to me, there's barely much thought spent on where people were born, how they got to live here and why. In fact, this is what I noted very early on just after arriving here in 1997. People would chat to me and the questions "where are you from" or "what brought you here" would sometimes not even come up in conversation, and if they did, it was much later than what I was used to in the other countries I've spent time in. Things change mightily though when there's yet another football event on. I've found myself in pubs watching footie when England was playing Germany and it felt like I was surrounded by Germans, and initially I was sure that all these Scots around me must have a Germany granny. They didn't. Next match Germany v Albania and nobody turned up. Germany v Scotland - all those German grannies were forgotten big time (even I shouted for Scotland...). Personally, I feel offended if someone supports the German team just because they want England to lose. I'd like people to support a team because they like it, have an affiliation with it, and not because they happen to play the one team everyone hopes will lose. On the other hand, having watched enough England v Germany fixes on TV, I'm sick to the bone of the references to 1966 and THE WAR. For eff's sake, it's just football and we're not at war right? And if you continue to use vocabulary as if we're fighting a war on the pitch, I'm starting to share those anti-English football team feelings of those around me. For eff's sake, it's just football and we're not at war right? Or are we? The discourse around the war is actually interestingly different in the UK compared to Germany. Here, it's about winners and losers, about military strategy and remembrance day. In Germany, it's about liberation and the horror that was the Holocaust. I've never seen myself as a member of a country that lost the war. To my generation, and even my parents' generation, the UK, alongside with the US and France, liberated us from evil, suffering, destruction and hunger. If ever there was a war that had to be fought, it was the one against the Nazis. And to me, it was not a war against Germany, and never will be (the Marshall Plan speaks volumes that it wasn't a war against the people of Germany). In fact, I listened avidly to BFBS, my favourite radio station in Germany, my cousin worked for the US army and we all just loved having the Brits and Americans in the country. So much so we didn't actually want them to leave (they were good for the local economy). (note: things were probably a bit different in East Germany but that's not for me to discuss,) As to feeling responsibility for the Holocaust - the only responsibility I ever felt was to put extra effort in ensuring that this would never happen again, regardless of where. So the discourse around football matches and any discussion of the war that sees England as the winner and Germany as the loser is more than alien to me. It worries me because it assumes that there is animosity still, revenge that is played out on the football pitch. From Germany's side of the fence, there isn't, and that's the big joke - England commentators making a big fuss about nothing, and I'm trapped in between explaining again and again how a match against England is nothing special to me, the German. That above all, I'm not at war with anyone. Oh, and I find that Faulty Towers sketch probably funnier than any Brit, because it holds the mirror to the British about their obsession with the war, it is oh so clever and hilarious. At times though I'm not sure if my interpretation of things comes with the mercy of the "Nachgeborenen" the generation born after the horrors. The generation that has the luxury of being able to claim not to have any responsibility for 7 million people murdered, and many more dead due to war, displacement and famine. My whole family was affected by the war and I never knew my grandfathers, my mother stopped her education to help in the home when her father died due to a war injury. It reduced her options in life and cut her education short when she must have been quite talented. Many friends of our family were displaced and suffered hardship after the war, while our neighbour lost her whole family to the gas chambers. So I can relate to the people who tell me of their losses. The son who never knew his father because the Germans killed him. I know the same story from the other side. But while I blame Hitler and his madness (rather than the Allied Forces), the son, now the age of my own father, blames the Germans for his loss and his mother's suffering. And for all I try to explain, my argument remains shallow, and there's nothing I can offer to bridge this river. In the end, he who suffered a loss, I feel, has the right to explain that loss for himself and make his choice of blame or responsibility. It's not about whose discourse is right or wrong, better or worse, and it's most certainly not my place to change minds, but to respect his views. Even if it means that I'm the German to him. My excuse: my first big crochet project. But the crochet bit is fine, just the counting and increasing isn't, and I'm not quite sure what happened because I really tried to get it right. Ah well. the kids have adopted it as the perfect princess / fairy castle carpet. In it: lots of memories. T-shirts of women's 10ks, Glasgow-Edinburgh cycles, Celtic Connection t-shirts, Mike Scott and other music t-shirts. Plus some charity shop finds. 13 t-shirts, one big heavy and colourful rug. I could take it back and try again, maybe I will, but not just now. I've got some unfinished project to finish off, because I'm in the finishing off, and not the starting again mood. And anyway, doesn't she look cute sitting on it? Who cares about the waves. A good few years ago, when I'd first arrived in Glasgow, I had a lovely Wednesday evening routine. I would meet up with my friend and colleague who stayed locally from me and we'd go to the ladies night in our local swimming pool. It was a fabulous weekly treat, right in the middle of the working week. First we went for a swim in the wonderful Victorian bath, and it's dim lightening which so reminded me of traditional Turkish baths. Next up was a session in the Sauna, a dip into ice cold water, some steaming in the steam room too. There were always sociable and interesting people to chat to in the sauna, and it was nice and inclusive where everyone felt comfortable with everyone else. The evening was finished off with a yoga class. It was pure bliss. And then they closed the pool. I tried to keep up the routine at other locations, but nothing was the same, nor did the distance to travel do any good for having a weekly routine. When the pool was announcing the plan to be closed, we were instantly gutted. Such a beautiful historic building, right in the centre of the maybe most densely populated part of Glasgow. It didn't make sense. While we were gutted, others were up in arms. On the day the pool closed, people chained themselves to the building so it couldn't close. It was then occupied for weeks. No, months. There was a vigil 24/7. I did but a couple of meagre day time shifts, but there were many who for months spent hours and nights in front of the building. The campaign to save our pool made me think about what it was that I liked about it. I'd never rationalised it but the campaign bit by bit did. The inclusivity was due to it being right in the centre of a very diverse area of Glasgow, which traditionally is an area where people who come into Glasgow from other countries settle. It's an area not too far from the centre, with lots of local shops, a self contained part of the city, close to a wonderful park yet with house and rent prices that are affordable because the tenements of the area are old and not greatly looked after, with no gardens, so they are not the same quality compared to those nearby, partly because many aren't owner occupied. Lots of migration to the area meant that middle class folk preferred to move somewhere else. There were homeless hostels nearby and yet, the shops run by people from many countries provide all you can ask for, and having lived there, I felt safe and snug there. The pool was right in the centre of it, and its Victorian built meant that it was perfect for anyone who didn't want to display their body to the public. There are no windows and the changing areas and ways to the sauna were separate for women and men. I wasn't conscious of it, but admittedly being body conscious it must have played a part in my choice of pool. And yes, it was the one place where I had conversations with total strangers, some disabled, some of different skin colour, of different faiths and different backgrounds to mine. I didn't find it worth mentioning at the time, it was only later, in the pool of the neighbouring council, where the middle class population won't talk to strangers, that I noticed what was lost. The campaign went on. A charity shop was set up, fundraising continued, the Govanhill Swimmers went around the neighbourhood in swimsuits practicing their swimming on dry land, i.e. the streets of Govanhill. There was a community garden. A local councillor was elected to push the case in the council. A singing group was established who penned songs about the pool and its closure to well known melodies. There were art projects too. On Saturday, 11 years (!) after the pool shut its doors to the public, it was once again opened to the community. It marked an extraordinary victory. And yes, victory it is. I hate to use words like that, but 11 years of relentless campaigning and the refusal to give in and continue to campaign for what we all knew was right paid off. As much as the powers that are had decided to take away the one community facility this empoverished yet vibrant part of Glasgow had, that decision was wrong and the pool is once more open to the community. Still dry, it has entered the first phase of being developed into a Wellbeing Centre. In maybe a year and a half or so we will hopefully be able to swim in it again, and I can show my girls where mummy used to swim. I so can't wait. It was very emotional seeing the huge crowd who turned up for the opening, and being able to see the pool from the inside again after 11 years. It seemed like nothing had changed, yet so much had, so much effort for this moment to happen. Govanhill, for all that counts, is richer for having gone through this community campaign and stands as a glowing example what community power and persistence can achieve, even if the politicians have turned their backs on Govanhill. Oh yeah, Peter Mullan and Nicola Sturgeon opened it. It's good to have some well known people support the baths and to get the launch into the news, but the work was done by the campaigners. So I didn't take there photo, sorry. 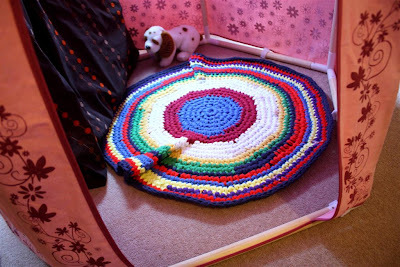 I've not knitted an adult sized item in, well, maybe 22 years. It's funny how knitting fell by the wayside, especially it occupying such a prominent position when I was a teenager. Was it that knitting fell out of fashion in the 90s? Was it that my last completed jumper just wasn't right (it's still sitting in my wardrobe, I can't bear to get rid of it, and won't wear it because it's all wrong)? Or was it that other things too over? I restarted knitting when pregnant with Cubling. Like many do. Knitting for little ones is just a nice start, and it was actually a knitted duck that I saw in a shop which got me going (made for my nephew who was due 12 weeks before my own first born). The inspiration provided by a knitting friend was also not to be underestimated (you know who you are!). So I knitted blankets, hats, cardigans, soft toys. 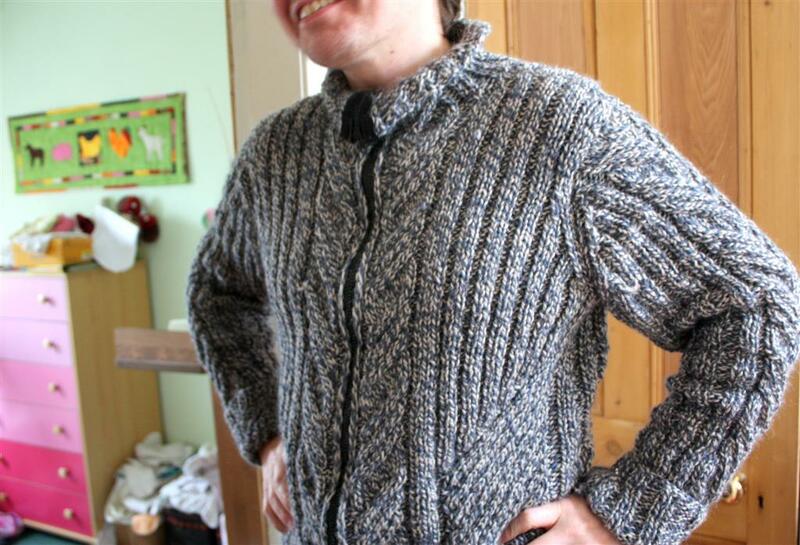 Most of the patterns in my favourites still are of that calibre, because my knitting time is still rather limited. Then I was given yarn which had been lying in some cupboard waiting to be knitted into a cardigan. After this friend had her second baby, she decided it wasn't going to happen and gave me the yarn. And, considering Mr Cartside has been a bit short changed in most of my knitting frenzy (he didn't get more than a mere pair of socks so far) it seemed only fair that the yarn should be made into a cardigan or jumper for him. 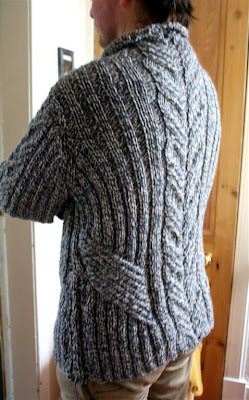 I trailed Ravelry for a pattern that I liked, that he liked. It struck me that there was very little in the line of jumpers/cardigans for men, and those that I found, well, they weren't my cuppa. Eventually, I stumbled across, the one and only, it was oh so perfect - we both loved it, the yarn was the right weight, and Jared Flood had adapted it. Ok, the latter had nothing to do with the whole thing, but somehow getting knit designer celebrity endorsement doesn't do much harm. Our minds were set on the Urban Aran, version Jared Flood. Then I realised that the original pattern (from Paton's Street Smart booklet) was out of print and that Jared Flood's notes on how he adapted it were useless without the original pattern. Not one to despair I explored all resources at hand, the wonderful internet, and the wonderful people on the internet who are total strangers, and oh so generous. So in the end, I got my hand on the pattern. 7 months later, here it is - with zip, collar that could be a tad longer and sleeves that could be a tad shorter, but hey, it's not that bad. Oh yeah, and I adapted the pattern too, I always do a little bit. The pattern itself is quite easy once you get into it, though it needs a bit of attention paying (I didn't and made a few tiny mistakes). 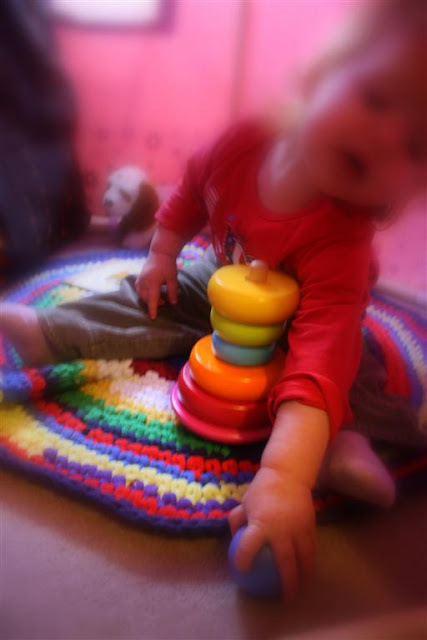 Sorry for the quality of the photos, we're down to snapshots these days of PhD writing up and toddling little ones which translates to being with the kids by myself .most of the time and as a consequence not managing to take great photos.